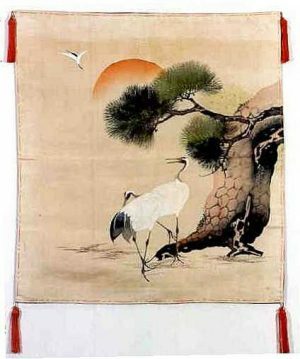 This is a marvelous Silk Fukusa, handwoven of Shioze Silk, a highly prized hard edged Silk This Fukusa or formal gift cover has been intricately embroidered with a dramatic Mandarin Crane (“Tsuru”). 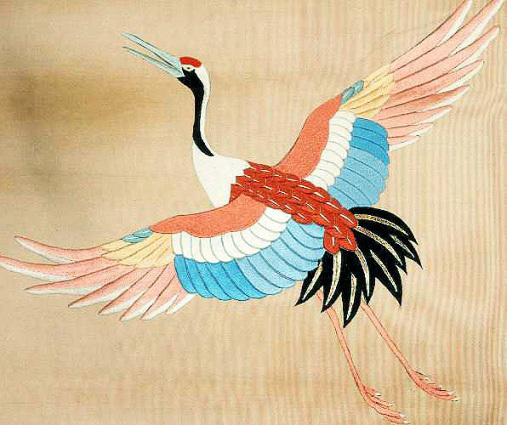 The Crane represents good fortune, which was a fitting subject for a Presentation Gift Cover. 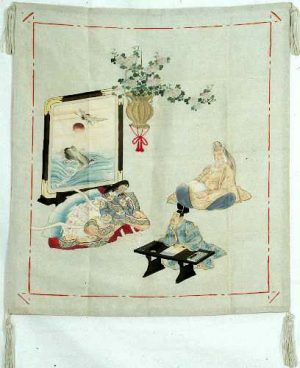 Wealthy families commissioned “Fukusa” with the intent of indicating their status. Emphasizing the value of this piece is the embroidery, which includes highlights in Silk threads as well as the handmade Pure Gold threads that have been “Couched” onto the top of the Silk. These precious threads are prepared by first painting a layer of liquid gold on thin, hand made paper, and wrapping it around several threads of Silk. Because of its delicacy, it could not be sewn into the fabric; but was, instead, “Couched” by being laid on top of the fabric, and then hand stitched to it. 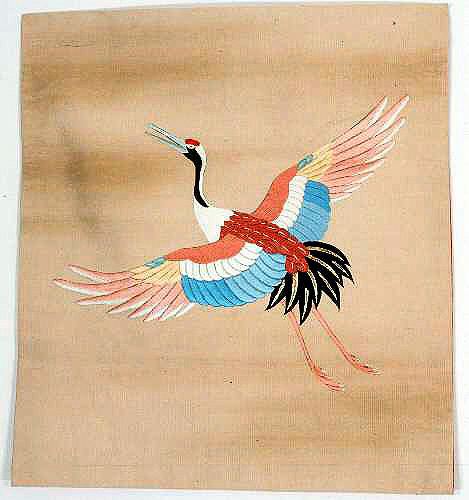 The pure Gold threads have been couched to the Crane’s tail feathers. 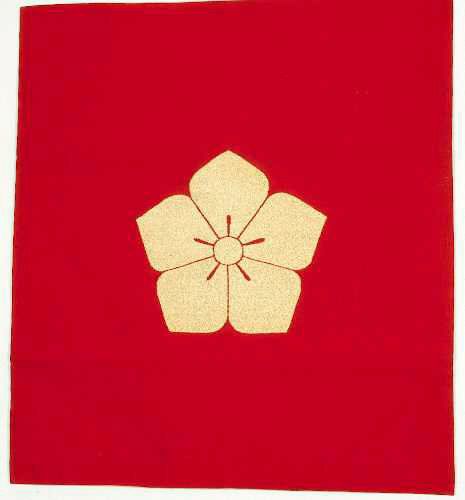 The Family Crest (“Mon”), woven in Pure Gold threads on the back is that of the Bellflower (“Kikyo”), revered as one of the 7 plants of autumn. 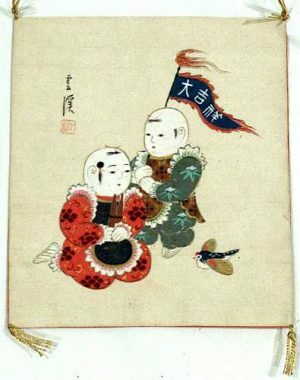 Fukusa were a valued part of the family’s wealth; and, as such, they have been cherished and preserved for generations. 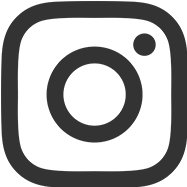 TTAC will personally pack and ship via UPS at company expense within the continental US. 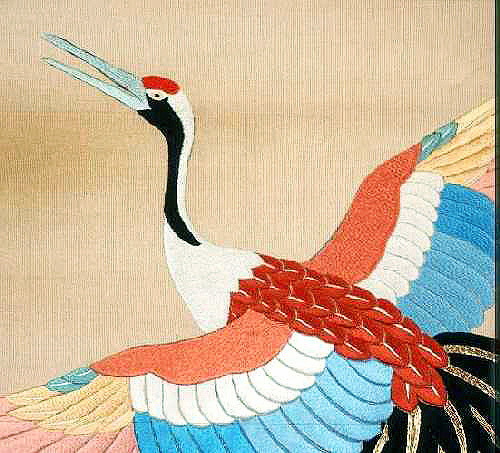 Pure hand woven, rare Shioze Silk, hand embroidered, including pure gold thread in excellent condition. Fabulous wall hanging or framed art work. The Fukusa is actually 2 separate sides sewed together at the outer seams. 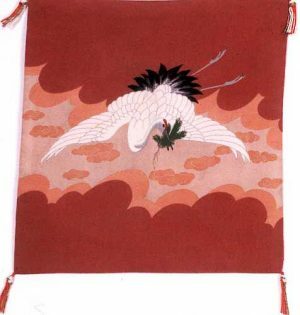 The Couched Crest on the reverse side of the Fukusa would also make a dramatic framed work of art.